It is a well known fact that many sacrificed and died for our right to vote in this great Nation of ours, and we must not squander that away nor take advantage of our right to vote. Yet we are now seeing newcomers and/or some undocumented DREAM Act immigrants who seem to be unaware of how hard black, brown, women and other minority groups fought and risked their lives for their right to vote. 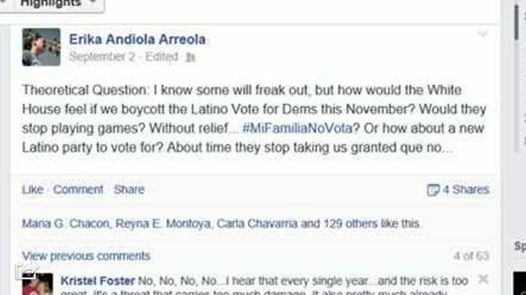 If these "TeaDREAMers" like Erika Andiola are wanting to "boycott voting," then so be it -- we know that undocumented immigrants and DACA recipients cannot vote anyway. Politicians already know people like Andiola cannot vote so her threats are of little use to politicians. 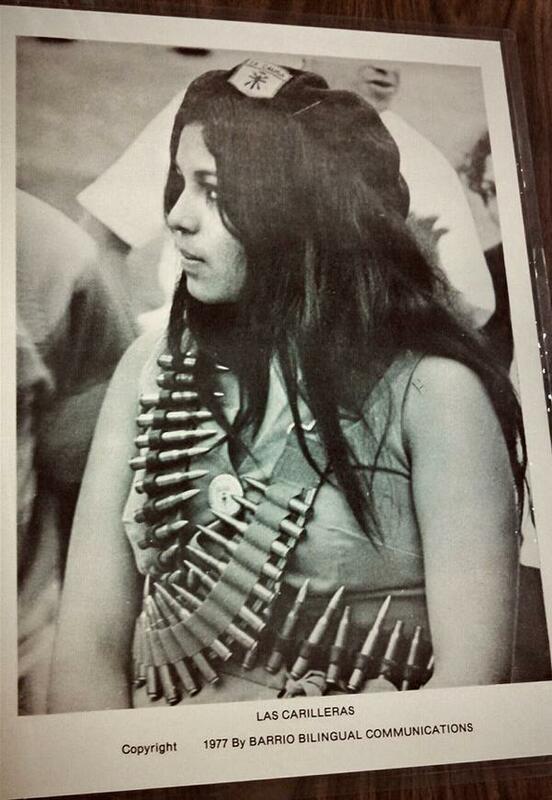 But as a Chicana activist, I believe it is shameful for Erika Andiola to entertain moronic ideas when our Chicano heroes and greats fought hard for us to exercise our vote. An example for instance, is when Dr. Hector P. Garcia, founder of the American GI Forum worked relentlessly for the removal of poll taxes while simultaneously holding fund-raisers to help pay poll taxes to register more Mexican Americans to vote. Dr. Hector P. Garcia was a Mexican American who fought for our Nation, and for the rights of Mexican American Chicanos to be buried in Anglo cemeteries. It is a well known fact the DREAM Act movement has been hijacked by some (what we call) TeaDREAMers. 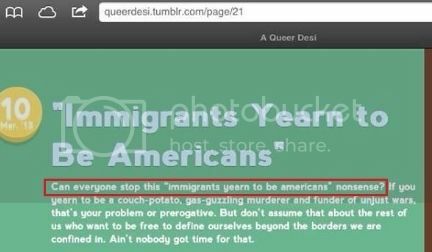 "TeaDREAMers are defined as students of the DREAM act movement" who have sold themselves to Tea Party Republicans. Several of these TeaDREAMers have set up entities to receive handouts and donations with little transparency when it comes to filing financial reports. The hijacked TeaDREAMers were helped by DREAMActivist.org via Mohammad Abdollahi (immigrant from Iran) and Prerna Lal (immigrant from Fiji) who began supporting Mitt Romney for President in 2012 even though Romney supported self deportation ideas. From there it poisoned other groups and this was intended by Republicans who wanted to conquer and divide the immigrant rights movement. 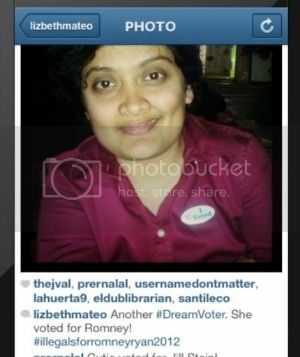 (Above) Erika Andiola working with same hijackers of CIR movement Congressman Luis Gutierrez distanced himself from. Gaby Pacheco -- a co-founder of UNITED WE DREAM campaigned for Republican Sen. John McCain for president in 2008, arguing that he had a better chance than Democratic Sen. Barack Obama of accomplishing immigration reform. However, it was Sen. McCain who voted against the DREAM Act in December of 2010. Since then, Pacheco and other TeaDREAMers have been working with Sen. Marco Rubio even though he has flip flopped on DACA, immigration issues and went so far as to embrace Arizona's draconian anti-immigration bill via SB 1070. The list of TeaDREAMers goes on and on, and genuine immigration rights' activists know for the most part who the TeaDREAMers are when and revealed themselves when they began supporting Mohammad Abdollahi of DREAMActivist.org. Abdollahi stated: "I am going to kill immigration reform in the most productive way this summer . Y'all have seen nothing yet." Both Carlos Galindo and Fernando Espuelas (national political radio show hosts) are the only two Latino political radio analysts who have been calling these TeaDREAMers to the carpet. Erika Andiola chose to side with the likes of Mohammad, along with several other so called "immigration" activists such as Jose Vargas, DreamAct Coalition (DRM), Ceasar Vargas and others. Many aligned themselves with those who intended on killing immigration reform even though Congressman Luis Gutierrez distanced himself from DreamActivist.org and their ilk. Mocoso (snot-nosed) TeaDREAMers have already gloated about hijacking immigration reform in 2013, and we know it is because many of them receive handouts/donations from a crisis situation. All one has to do is learn from history lest we repeat the same mistakes. Voting creates political shifts and Chicanos have learned how to change things with our vote. It does not take a rocket scientist to learn how the Republican Party adopted an anti-immigration platform in 2012, so the bottom line is to vote for the lesser of two evils. As independent voters, we can weed out the extremists during the primary election phase while casting our final firm vote on general election day. One of the principles which distinguishes Los Brown BeretsSM [La Raza Unida 21] from other organizations with similar names, is the fact that we do not reject the electoral process, but instead advocate that everyone exercise his right to vote. We do not operate outside the system, but within it. Registered independent voters demonstrated their power in yesterday's Arizona elections and across the nation. We are getting better at this and are ahead of the independent curve. Radio show host via Carlos Galindo along with other several political pundits uniting and coalition building front will grow, get better and refine the art of independent voting. Requesting and honing in on the D or R ballot is key in order to weed out extremists and corrupt politicians. We are celebrating the loss of extremist politicians like Tom Horne and John Huppenthal who drew the line in the sand against Chicano / Ethnic Studies.